Prices are based upon average lawn condition. Overgrown, sloped, corner, and terraced lots are extra. Prices are per visit and subject to change. Some restrictions may apply. Service Area is limited to the area in SW Calgary bounded by MacLeod Trail in the east, 75 St on the west and between the Bow River on the north and the Glenmore Reservoir on the south. 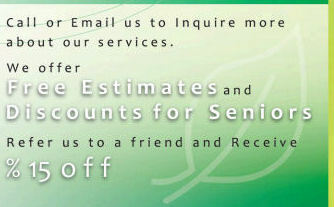 Seniors Discount: A 15% discount is applied to Seniors over 65 for any services supplied by Russell's Lawn Service. • Snow Removal Season (November 16 to April 15) - Six month average 65 snow 'occasions' annually. Snow is removed if 1/2 inch falls. Minimum charges apply. Snow is removed within 24 hours from when the snow stops - normally removed within 12 hours or less. Charges for services are invoiced monthly for payment. Note: Winter services have no contract - don't worry, be happy! Cancellation is free anytime if your account is paid in full. No break up fee. Charges for services are invoiced monthly for payment. Cheques, cash and Interacc accepted. No contract - don't worry, be happy! Cancellation is free anytime if your account is paid in full. No break up fee. Student turned Graduate owned and operated, Russell graduated from MRU in 2011 with a Bachelor in Business and Administration. His business has gradually increased due mainly to 'word of mouth' from satisfied customers. Passionate about his craft Russell has chosen to continue on developing and improve upon green space management through going green initiatives and innovative techniques.
. Call 403-686-LAWN(5296) to arrange a Free Estimate. A 15% discount is applied to Seniors over 65 for any services supplied by Russell's Lawn Service. For a referral to Russell's Lawn Service for a lawn, tree or hedge care service, existing clients receive a free application of Scott's or CIL brand fertilizer.